This USA made True Low Air Loss Hospital Mattress provides all of the benefits of the standard model healing up to stage 4 bed sores. This low air loss system effective wicks away moisture to keep the patient cool and dry preventing skin break down. The self adjusting mattress system redistributes pressure healing and preventing the most complicated bed sores. The user friendly digital pump includes auto firm, seat inflation, and alternating pressure pulsation modes. 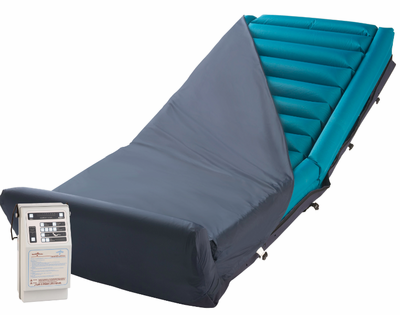 This low air loss mattress adjusts to the patients weight for superior comfort. The new built in alternating pressure feature offers additional pressure relief and advanced healing therapy. This true low air loss mattress system is elite among all hospital air mattresses in the market today. Ideal for home healthcare, hospitals , or nursing homes.